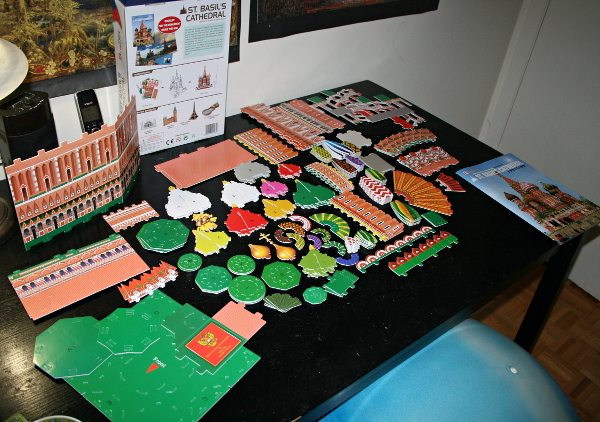 The print is bright, the pieces separate well and fit together firmly, the instructions are very clear and all pieces are clearly marked. Here is the box, the booklet (see below for the historical information contained therein) and sheets with puzzle pieces. 1. Separating all the pieces from the sheets in which they were embedded. 2. 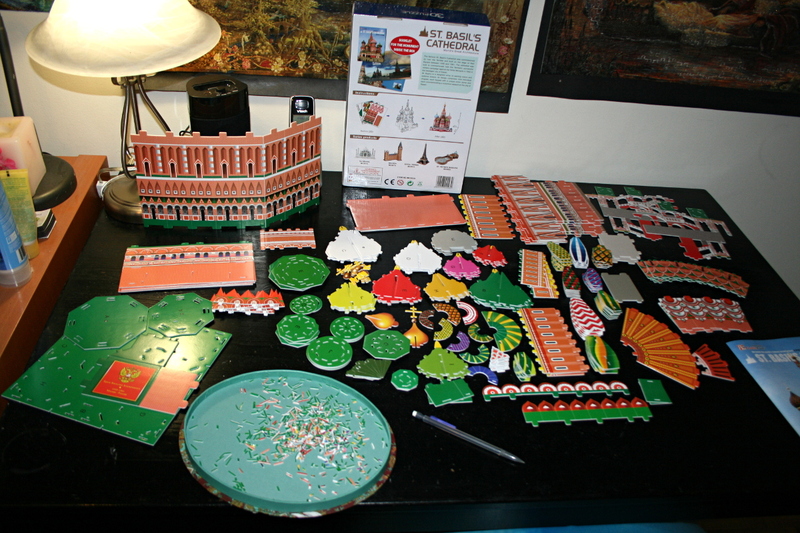 Punching out the holes in the pieces (I used a tip of a mechanical pencil). One thing I did find a bit of a concern, is that I had something close to a mild allergic reaction while separating the initial pieces from the sheets. ‘Tis the season for environmental allergies to which I am susceptible, but this seems to have been specifically connected to me working with the puzzle. I must test this theory on another one of the series. Perhaps next time I’ll let the sheets air out first. It was not a strong reaction. The box states that the puzzle is made of paper and expandable polystyrene (EPS) foam board, which the company’s site claims to be non-toxic. I’ve had similar reactions to very old second-hand puzzles (perhaps the ones that came from smoking households? ), but that is very rare. The company’s site could use some work – it appears they did most of their coding in ASP and failed to test in multiple browsers. As a result, among other things, their pagination does not work in Firefox, but I have deduced that adding &page=2 (or whatever page number one is looking for) allows one to browse through their products, and I must say – I have bookmarked quite a few for further puzzling adventures. 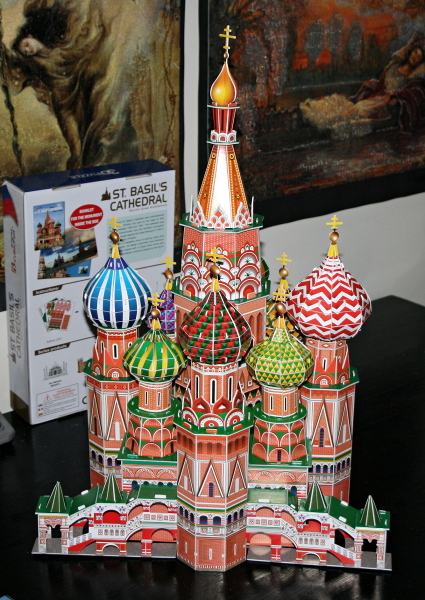 Overall a beautiful puzzle, a pleasure to assemble, sturdy to move around and complex and good-looking enough to leave assembled as a model. My almost-3-year-old has been admiring it for several days now. “We build the world’s famous architecture. 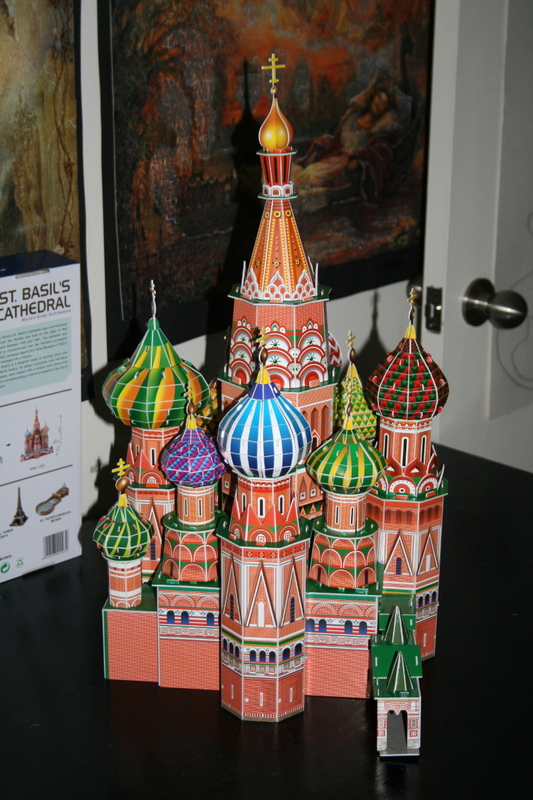 The famous St. Basil’s Cathedral was commissioned by Ivan the Terrible and built on the edge of Red Square between 1555 and 1561. The cathedral was built to commemorate Ivan the Terrible’s successful military campaign against the Tartar Mongols in 1552 in the besieged city of Kazan. 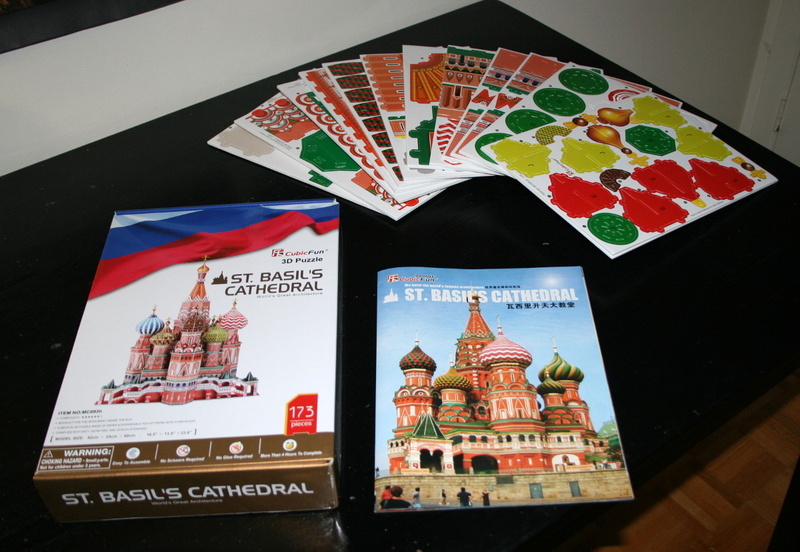 St. Basil’s is a delightful array of swirling colors and redbrick towers. Its design comprises nine individual chapels, each topped with a unique onion dome and each commemorating a victorious assault on the city of Kazan. A popular historical legend says that Ivan had the architect, Postnik Yakovlev, blinded to prevent him from building a more magnificent building for anyone else. In fact, Postnik Yakovlev built a number of churches after Saint Basil’s, including one in Kazan’. St. Basil’s Cathedral is a symmetrical architectural ensemble consisting of eight chapels surrounding the ninth temple, which is the highest one. It is topped with a hipped roof. Each chapel bears the name of a saint. The central temple is dedicated to the Intersection of the Blessed Virgin. The chapels are conjoined by the system of passages. The cupolas that top the chapels are different from each other. Each cupola is decorated with windows, niches, and cornices. The cathedral impress as a festive and elegant one. 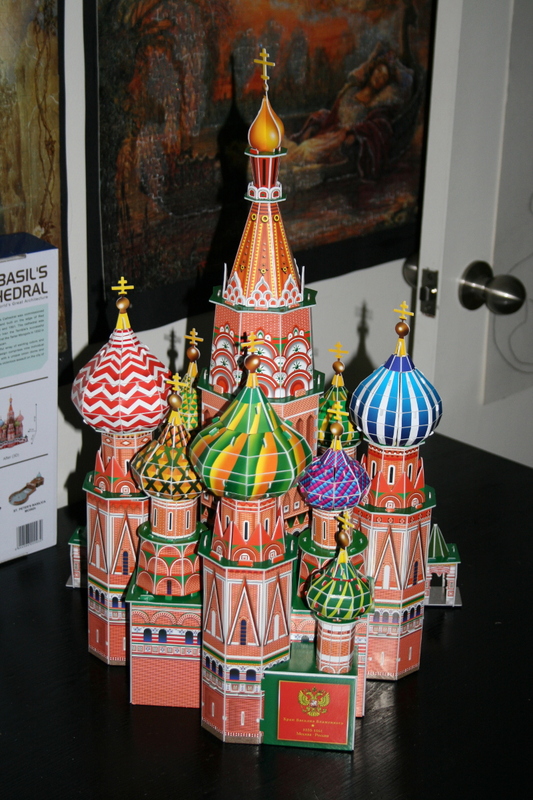 The powerfully eastern design of St. Basil’s reflects both its location between Europe and Asia and its historical origins. 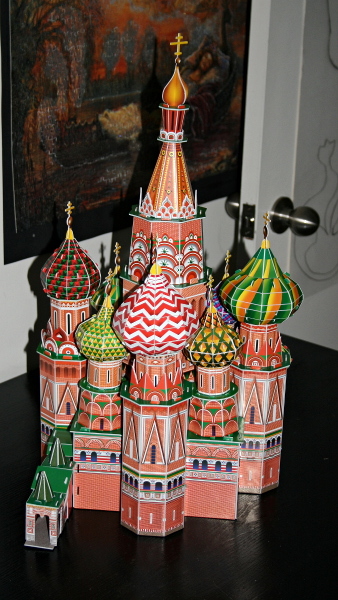 Since the Kazan Qolsharif mosque had been the principal symbol of the Khanate captured by Ivan the Terrible, some elements from the mosque were incorporated into the cathedral to symbolize the victory. The interior is a maze of galleries winding from chapel to chapel and level to level via narrow stairways and low arches. The walls are painted in floral and geometric patterns.